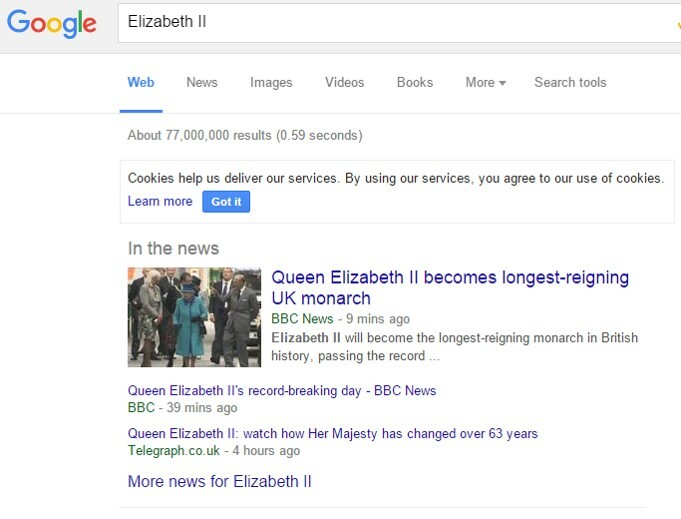 Queen Elisabeth II breaks a record – and who is ahead in the Google News Box? As of Wednesday, 9th September 2015, Queen Elisabeth II set a new record: she has now been the head of state of England and the Commonwealth for 63 years! No-one in English history has been on the throne this long. This is obviously a huge subject of conversation in the UK – and in the media. We analysed who was particularly successful in the Google News Ranking for the keyword “Queen Elisabeth II” on September 9. As seen in the chart above, the BBC is very much ahead. As of 01:19 a.m., they lead the Google News Box – either as bbc.co.uk or as bbc.com. From 3 a.m. until 8:30 a.m., the BBC is not only leading the News Box (bbc.co.uk), but also comes second with a different article (bbc.com). From this moment on, something starts moving within the News Box – at least when it comes to places 2 and 3. Theguardian.com and telegraph.co.uk alternate between 2nd and 3rd place until noon, and therefore get their share of Google News Traffic. Nevertheless, between 12:18 p.m. and 1.03 p.m., they make way for the BBC again (see screenshots). Screenshot of the Google News Box at 12.25pm. Screenshot of Google News Box at 1.03pm. After 1:15 p.m., fortune.com, cnn.com and yahoo.com – amongst others – are present in the News Box. Furthermore, some smaller players make it into the popular Box during the day and also get their share of the Google News Traffic (e.g. jezebel.com, stuff.co.nz, wsj.com). 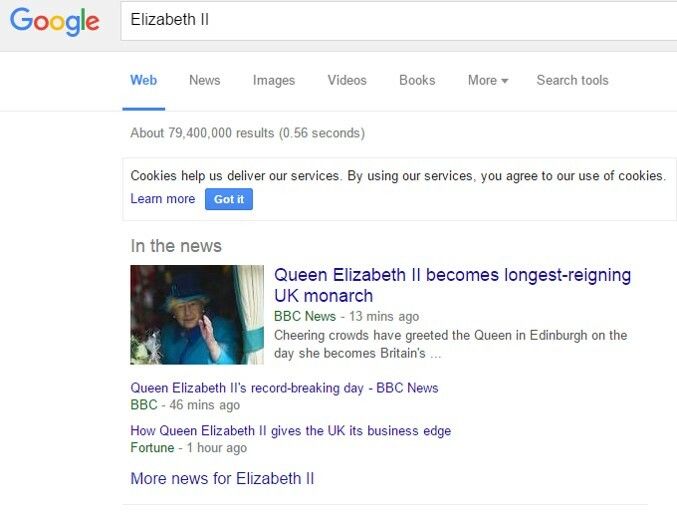 The publisher, which is clearly the winner in the Google News Boxes on this historic day for the empire, is the BBC.